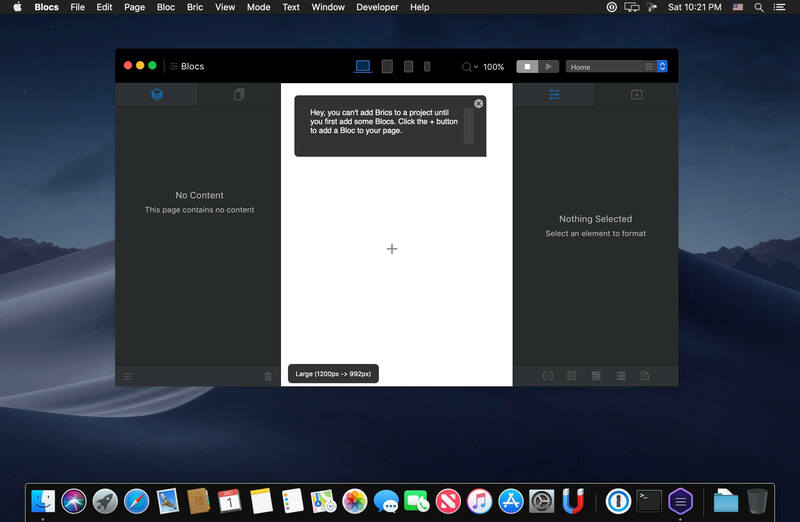 Blocs for Mac is a fast, easy-to-use, powerful visual web-design tool that lets you create beautiful, modern websites without the need to write code. Cleverly designed to accommodate complete beginners or those familiar with web design. You will love building with Blocs. Designed For Simplicity - Building with Blocs is simple and fun. A clean, intuitive interface makes creating sites unbelievably quick. Simply click, select, edit and enjoy stacking blocks to build your website. Its ease of use will make you feel right at home. Powerful Styling features - Behind the simplified interface of Blocs lie some of its more advanced editing features. When you are ready to get more creative with your designs, Blocs will grow with you. You set the pace. Create CMS-Driven Websites - Blocs has integrated support for a range of premium (paid) and open source (free) third-party content management systems. It's now possible to easily create powerful, dynamic websites, that can be updated and contributed to, right from your web browser. 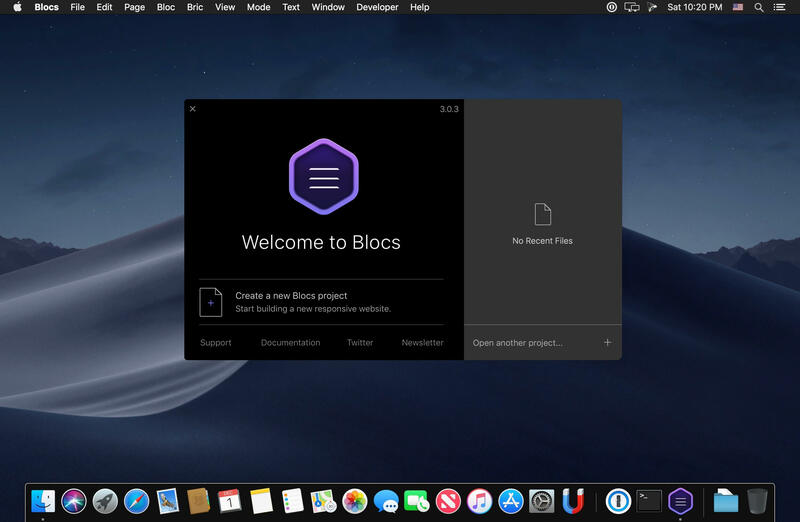 Time-Saving features - Paint mode, global swatches, auto text colouring and one click animations are just a few of the playful, time saving features in Blocs. You’ll be amazed how quickly you can create a website. Added categories to Bric Bar and Bric Sidebar. Added Canvas Text Size Freehand Controls. Added ability to set active page class on links that match current URL. Added ability to hide sidebars. Added ability to name Global Swatches. Added layer tree context menu items that enable Expand/Collapse contents of a layer. Added Expand all / Collapse all layer tree controls. Added Solo Mode layer tree option. When deleting a page, its entry in Menu Manager and navigation is now removed. Added refresh button for Menu Manager data fed list items. Added export settings to project settings. Added new developer API classes. Include UI title label data in Bric Builder layer tree. Added Custom Bric category selector in Bric Builder. Fixed issue that allowed page scroll when modal is open. Fixed issue that made selecting nested span tags impossible. Fixed issue with terms window on MacOS Sierra. 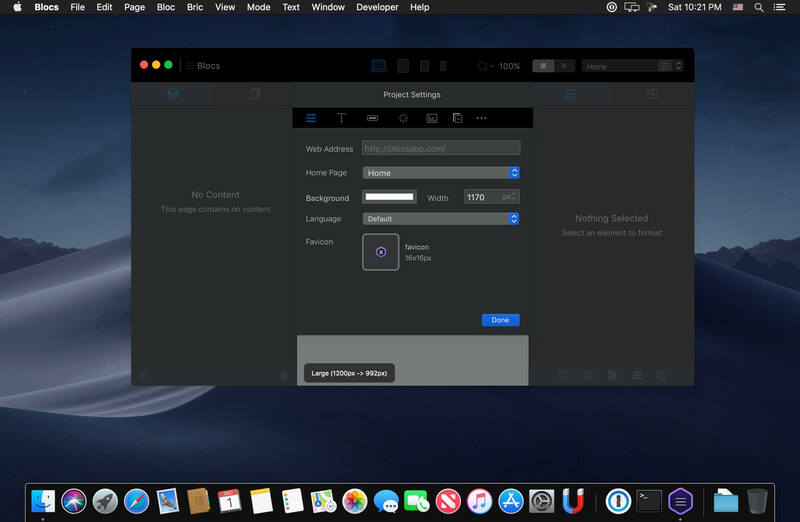 Fixed issue with main prefs styling on Mojave when OS is dark mode and app is light mode. Fixed various issues that caused missing sections in layer tree. Fixed issue that broke form redirects if target page had a php suffix. Fixed various issues with forms settings not refreshing in preview mode. Fixed issue that caused broken link if success link for form is set to home page. Fixed light box interactions with clean URLs. Fixed issue that caused project settings icon to become unselected when clicking currently selected item. Fixed issue more issues with layer tree and formatted text. Fixed issue that caused local fonts with spaces in the name to break on export. Fixed issue with form JS required files being added to page header when exported if a form exists in a code widget our custom Bric. Fixed missing trailing slash on clean url page links. Fixed issue that prevented Core Assets being permanently deleted. Prevent changes to page name settings effecting links to page that have custom titles. Fixed view subclass resources help button on Class Manager. Fixed issue with Bric Builder assigned artwork sizes being too big when assigned on a retina screen Mac. Fixed issue with pre-loader classes being included in style sheet when its switched off. Fixed issue that caused assets stored on external drives to remain in a project when deleted. Fixed issue with removing assets that are assigned in project settings remaining in project. Fixed issue that caused audio players using hosted mp3 files to break on export. Fixed issue that caused Blocs to crash on export if an audio player has no value set. Fixed issue that prevented reseting logo image on design canvas when current logo is deleted from project settings. Fixed issue with active marker displaying in the wrong position. Fixed issue that caused navigation Bric to not show in Bric library. Fixed issue with preview style dropdown not being populated correctly in Bric Builder. Fixed issue with drop downs in navigation not showing in layer tree. Fixed issue with installing Page Template .bex files. Well, Ive d/l the latest 3.0.7. to my MBPro also running 10.14.2, and it opens OK (see link). I havent tested 100% this software as i always been a "RW (Rapidweaver)" user, and the only aspects meaning worthwhile is that I HAVE NEVER DISABLED SIP in my macOS but GATE KEEPER is.